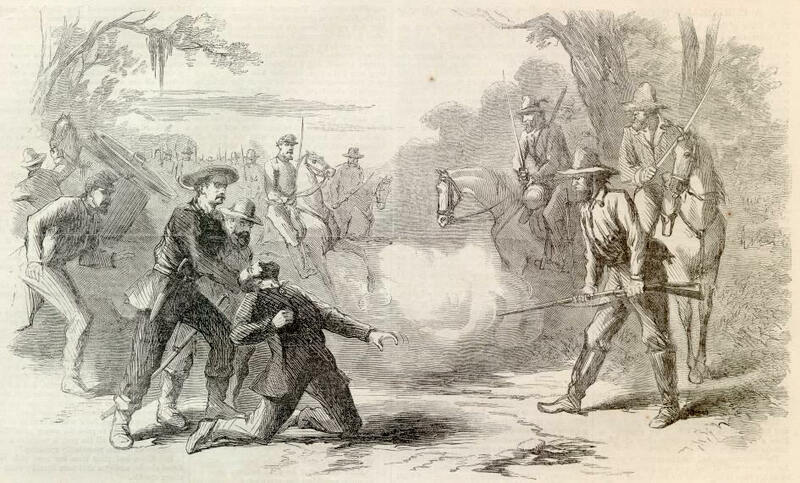 Welcome to the Civil War Harper's Weekly online newspapers. These newspapers contain rich illustrations and descriptions of the key events of the Civil War. They are a critical resource that can be used to develop an in depth understanding of the key issues of the conflict. 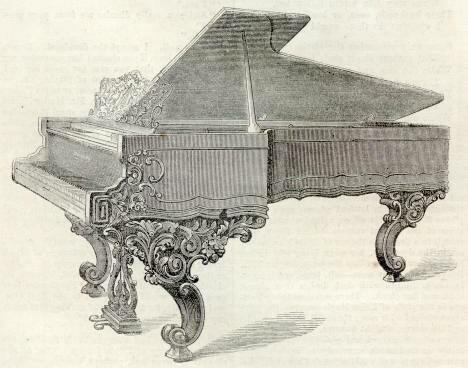 WE publish below two illustrations of STEINWAY's PIANOS, made by Steinway & Sons, of Walker Street, New York City, which received a first prize medal at the London Exhibition, having been characterized by the jurors as "Powerful, clear, brilliant, and sympathetic tone of piano, with excellent workmanship shown in grand and square pianos." In order to show how widely these pianos are appreciated abroad, we subjoin a few extracts. "These magnificent piano, manufactured by Messrs. Steinway & Sons, of New York, are without doubt the musical gems of the Exhibition of 1862. They possess a tone that is the most liquid and bell-like we have ever heard, and combine the qualities of brilliancy and great power without the slightest approach to harshness. We will describe, as well as we are able, the peculiarities belonging to them. The bass-covered strings are carried over and across the lower steel ones. By adopting this plan the bridge on which the covered strings rest is in the middle of the back part of the sounding-board, which naturally gives them a greater amount of vibration than if the bridge were placed on one side of the sounding-board, as in our English pianos. The manner in which the metallic plate and bare are arranged is very excellent, the whole being cast in one piece, by which means all possibility of jarring (which frequently occurs when the bars and plate are made separately) is done away with. Messrs. Steinway's patent repetition action is another great feature in these pianos, for although it produces a repeat of the most perfect kind—has a check that is firm and unvarying, and of a most ingenious character—the whole thing is so extremely simple that it can be understood almost at a glance by any ordinary piano-forte tuner; and we feel bound to add that they have an elasticity of touch and firmness of blow that we have rarely, if ever, seen surpassed. for they use a damper which stops the sound as soon as the hands are raised from the keys. 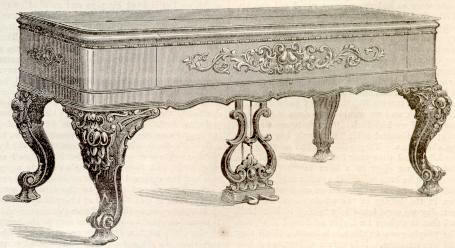 The American makers are generally very elaborate in the getting up of the cabinet work about their pianos. They are adorned with very rich carved work, are massive and elegant in their appearance, and have a polish on them which makes the surface of the wood look more like a piece of plate-glass than what it really is. We would advise all who have a taste for music, and are fond of hearing a good piano, to visit these magnificent instruments the next time they go to the International Exhibition. They are to be found in Class 16, United States Department. We are informed that Messrs. Steinway are to receive a first-class medal for their pianos. The whole of Messrs. Steinway and Sons' pianos have been purchased by the enterprising firm of Cramer, Beale, & Wood, the proprietors of the great Piano-forte Gallery in Regent Street, who, we understand, are appointed the sole agents for them in England." Pole, Mus. B., F.R.S., Secretary, London; J. Schiedmayor, Zoll-Verein; Earl of Wilton, G.C.H., London; Henry Wylde, Mus. D., London. "And the awards are: Steinway & Sons, medal, 'Powerful, clear, and brilliant tone of piano, with excellent workmanship shown in a grand piano and a square piano of very large dimensions.' Messrs. Steinway's indorsement by the jurors is emphatic, and stronger and more to the point than that of any European maker." "The firm of Steinway & Sons, from New York, exhibits two pianos—one grand piano and one square piano—both of which have particularly attracted the attention of the jury. This firm, not known among the exhibitors of the first exhibition in London, has taken in a very short time an astonishing development. Messrs. Steinway & Sons have, to say so, the monopoly to sell pianos in America, and in New York they have considerably outstripped the other manufacturers. Undoubtedly, therefore, Messrs. Steinway may claim to be classed with Messrs. Erard, Pleyel, Broadwood, etc. Such importance naturally called the attention of the international jury to the Steinway pianos; but there were better reasons still for their attention, and the first of these reasons is the excellency of the pianos. This firm is also the only one which distinguished itself in the manufacturing of pianos by new inventions, worthy of being favorably considered." "I have been able to judge upon the effect of this new method, and can tell you that the square piano of Messrs. Steinway fully possesses the tone of a grand piano; it sounds marvelously. The ample sound, the extension, the even tone, the sweetness, the power, are combined in this piano as in no other piano I have seen, and this is the result of the new inventions which I mentioned." going to receive the medal for sonority and clearness, brilliancy and sympathetic tone of their pianos." The Pacific Mail Steamship Company's steamer Golden Gate was a side-wheel steamer, 2067 tons, and was built at this port by William H. Webb, in 1850. Her dimensions were as follows: length 285 feet, breadth 38 feet, depth of hold 30 feet. Her draught of water was about 16 feet. She was one of the finest boats on the route between Panama and San Francisco, and was a favorite with the traveling public. She was launched January 21, 1850, and was built for Howland & Aspinwall. Her engines were constructed at the Novelty Works. She was a fast vessel, and could accommodate about nine hundred passengers, besides a large quantity of freight. She was rated at the Underwriters A2, and her securities against fire were recorded "good" She had two independent fire-pumps, and sufficient hose, buckets, axes, etc. She had oscillating engines and two cylinders of eighty-five inches each, with a nine-feet-stroke piston. She carried from eight to twelve boats, sufficient to carry several hundred persons. The Golden Gate was repaired in 1856, 1858, 1859, and latterly she has been put in excellent order. Manzanilla, off which it appears the steamer was when the fire broke out, is in the bay of Limon, Isthmus of Panama. The steamers from San Francisco call there to ship treasure brought from the mines of Coloma, in Mexico. It is about three hundred miles south of Acapulco and about fifteen hundred south of San Francisco. On the 27th ult., at a quarter to five P.M., when fifteen miles north of Manzanilla, while the passengers were dining, an alarm of fire was heard. The steamer was promptly headed for the shore, three and a half miles distant, the flames meanwhile making fearful headway. At a quarter after five the upper deck fell in. Soon after the steamer struck the beach, and the passengers and crew who had not got into the boats jumped overboard and endeavored to swim whore. About one hundred, including five children, swam or were washed ashore alive. The ship burned to the water's edge and soon disappeared. Those passengers who reached the shore made their way near to Manzanilla, where they arrived on the 28th, just as the steamer St. Louis arrived up from Panama. Some few others escaped to Manzanilla in boats. One boat, with thirty persons on board, has not been heard from, but probably made the shore south of Manzanilla. PIANOS EXHIBITED BY MESSRS. STEINWAY & SONS, OF NEW YORK, AT THE GREAT INTERNATIONAL EXHIBITION OF LONDON.